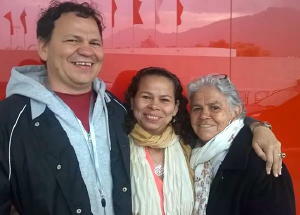 We have known Claudio and the Sierra family for more than ten years. LifeNets had helped them earlier set up a video business that helped several in the family make a living. You can see a report about about this here. One of the young men, Claudio, was able to come to Ambassador Bible College for a year of study. We really appreciated getting to know him and loved his always cheerful presence. He had difficulty with his vision and needed corrective surgery. It was brought to our attention by Scott and Gayle Hoefker who travel often to Colombia. After several examinations an operation was performed a few days ago. From an early age I suffered from hyperopia which caused me major problems in my school development. To get some glasses and specialized treatment was very expensive. My family alone I could buy my first glasses when I was 14 years old. Henceforth he could not afford a specialist doctor for the cost and I had to only rely on glasses, but the situation with my vision was deteriorating. When I turned 42 years old I was able to see an eye specialist who detected the reason for my visual impairment. He discovered a retinal detachment that could be corrected with laser treatment. Three days ago I had surgery and was able to recover up 80 percent of my vision! It is a great blessing that God has put it in the hearts of friends and brothers as you to so generously fund this great blessing. Thanks my friend and through you I thank those who helped through LifeNets. I called you my friend because our relationship was developed a few years ago when I was studying at ABC and remember much our warm conversation in which even talked about the possibility you can came to Colombia. I want to see you again buddy and share with you and your wife this great blessing. Thanks again and greetings to Beverly, both whom I remember pleasantly. I pray to God that what you did to me is counted as a treasure in heaven and be rewarded for this humanitarian gesture.